Do you mind.....if I give you some of myyyyyyyy.......12 Play??? What's up Mofoville?! It's been a long time but I AM BACK! Let's pause and bow our heads and thank God that today is the day the Lord has made, and 20 years ago on November 9, 1993, HE allowed 12 Play to come into our lives. Amen and let's body roll! Now most of us can remember our first tapes, our first record, album, cd, and digital download purchase.. and there are some albums along the way that just hit you right in your soul and you still jam to it years later. 12 Play is one of those albums. Put aside all the legal drama that R Kelly has gone thru cuz this ain't the purpose of this post, it's a blog to celebrate all the 12 ways a mofo is supposed to love on you and sweat your baby hair out. Do you recall when you got the 12 Play album Meik? I'm glad you asked cuz I sho nuff do! I recall it was a cold day in the mountains of Asheville, and it was a time in my life that cheerleading ruled everything, I ate, breathed, slept, everything cheerleading, so I was only checking for Michael Jackson songs or songs that could work for dance routines and ish at the time. Also at the time there was a well..let's just call him bugaboo that I couldn't seem to shake. He would call my house all the time ( I wish I could recall how he got my number but that's neither here nor there) and he would constantly tell me how much he liked me. He would come to our games and didn't even go to our high school, it got to be a lil much when folks would be like "Ohhhhh you are bugaboo's girl!" jflk;asdjfkl;adjf;klsdj;fjasd;fasdfsdj; <-----curses!! Nawl..Nawl..NAWL. So what it boils down to is I wasn't interested in him, and he had a bad lil habit of lying about everything. So anyway, he calls me up probably a few weeks after the album had already been released and says he has a gift for me. Yeah ok.. I know you lie. This mofo CLAIMS he walked from West Asheville to my part of town to deliver this gift (but I bet he got that arse on the bus cuz it's too cold in the mountains for all that ish) and he knocks on the door. I answer...he hands me a brown paper bag that looks like it's been thru some things and says Merry Christmas..here's your gift. I open the bag and the light shined down on the R Kelly 12 Play album. Thanks dude! But wayment.... wayyyyyyyyment.... The cover is all cracked and dented...the plastic has already been ripped off.. Ummm..... He says oh, that's the way it came. Now mind you I'm in high school at this time and may not be the brightest or the most savvy but dammit I KNOW cd's don't come like this. He mumbles and says he has to go and high tails it out of our yard. I run to my stereo to play it...................cd is scratched to the highest of high.. and I just..............well.. I guess it's the thought that counts..but who gives someone a damaged cd to prove their love or lust probably in this case?!!!! luckily my deddy did something to the cd so I could listen to it without all the skipping n ish.. tho if he knew what Kells was singing about I wonder if he'd let me listen to it? LOL.. Anyway.. 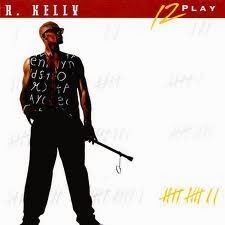 Happy Anniversary 12 Play ... some of y'all were probably conceived off this joint.. This song is one of my favs off the album..do you have a fav? Lesson Learned: Keep body rolling to 12 Play..it's the ish 20 years later.. that's how you define classic music. thanks 2 ya deddy 4 it so u could listen to it...lol...yes, sweat all ya baby hairs OUT and then some!